Bid adieu to hair breakage, split ends and dandruff with this Greenberry Organics Organic Coconut Oil. Get radiant skin and lovely mane with this 100% pure and organic product. It conditions the hair and provides necessary nutrition to the facial skin. The anti-fungal qualities of this lightweight oil render it an excellent natural remedy to fight dandruff. About the Brand: Greenberry Organics are the makers and first in India to introduce Global Natural Standard skin care and bath care products with 100% Natural and Botanical ingredients. The brand embraces the fundamentals of traditional Ayurveda and advanced apothecary but defies the concept of conventional off-the-shelf beauty products. It focuses on infusing pure plant-based ingredients so that all products are safe to use on skin and hair, even on children. The products strictly steer away from the 15 most harmful chemicals present in most beauty products like - soap, sulphate, paraben, phthalate, BHT, artificial emulsifiers, mineral oil, petrolatum, wax, silicone, DEA/TEA, phosphates, limestone and chalk, chlorine, and synthetic colors and pigments. Instead, the brand used pure Aloe Vera juice in all the product blends along with other plant-based substances. 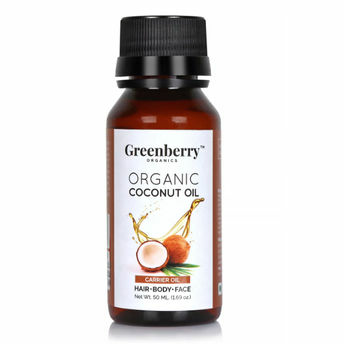 Alternatively, you can also find many more products from the Greenberry Organics Organic Coconut Oil For Face Body & Hair range.